Watch for Closing Windows. Yes, the D300s replacement conversation continues. Ad infinitum, it seems, as we’re now three years into the “where is it” wait. The problem I see is this: the window is closing and Nikon may end up mis-timing a replacement launch if they’re not careful. Article on dslrbodies.com. Still Dreaming. don’t know if it’s just the Asian business press not getting details right, not challenging assertions, or whether something is getting lost in the translation, but consider this quote from Nikkei Asian Review. Article on dslrbodies.com. September Software Updates. Article on dslrbodies.com. The dpreview Nikon Interview. dpreview posted an interview with Toshiaki Akagi, an executive in Nikon’s development organization. Article on dslrbodies.com. Chasing Perfection versus Balance. I had four cameras with me for the month of August: Sony RX100III, Nikon V3, Nikon D7100, and a Nikon D810. Which camera did I keep coming back to? The D7100. Article on dslrbodies.com. Impressions. Topaz has a new plug-in out, called Impression. Here’s a quick and dirty test on a D3x image I took a few years ago. Article on dslrbodies.com. The “Lost” Photokina. If you were looking for something earth-shattering out of Photokina, it’s likely you didn’t find it. What you got instead was companies doubling down on bets already made and reverting to modest iteration. Let’s look at the bullet points for the show company by company. Article on dslrbodies.com. Photokina Mirrorless Scorecard. Now that the major announcements are all done and I can clear my head and contemplate the overall impacts on both the camera market and on each mirrorless system individually, it’s time to do some results scoring. Article on sansmirror.com. Really, How Hard is it to Grind Some Metal? Nikon has again issued an apology to Nikon 1 customers, this time for the 70-300mm f/4.5-5.6. Article on sansmirror.com. Smartphones Become Compact Cameras. Two introductions during Photokina showed that smartphones aren’t done gobbling up the low-end compact camera market. Article on gearophile.com. Interchangeable Lens Market Shares? A comment by a Sony executive at Photokina had me scrambling for my calculator. 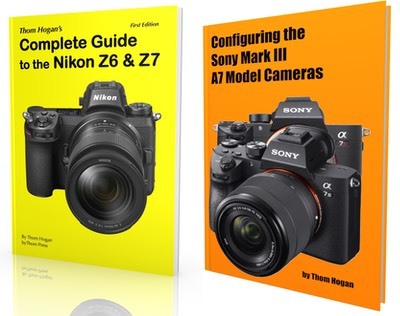 Could it be that Sony is finally challenging Nikon in terms of interchangeable lens camera market share? Article on dslrbodies.com. Phase One Offers Free Sony Converter. Article on sansmirror.com. Nikon Updates Software for D750. Also Apple adds D810 compatibility for OS-X. Article on dslrbodies.com. Capture One Pro 8 Announced. Phase One used Photokina to announce and release version 8 of their Capture One raw converter. Article on dslrbodies.com. More m4/3 Announcements. Article on sansmirror.com. Nokton 10mm lens data page. Leica T’s Up New Lenses. Article on sansmirror.com. 11-23mm lens data page. 55-135mm lens data page. Nikon Naming, Again. I spend a lot of my time doing the same thing that Nikon marketing does: answering questions about cameras and how they’re different. Nikon’s naming schemes don’t make that particularly easy. Article on dslrbodies.com. Samsung NX1 and 50-150mm f/2.8 Lens. The just announced NX1 is an APS sensor (1.5x) crop NX mount mirrorless camera designed like a high-end enthusiast DSLR. Article on sansmirror.com. NX1 camera data page. 50-150mm f/2.8 lens data page. The New High-End Compact Standard. t seems that Sony started something with the RX100: use a 1” sensor with a fast mid-range collapsing zoom and put it into a body that is shirt-pocketable. Now we have the Canon G7 X and Panasonic LX100. Article on gearophile.com. Airbus versus Boeing. A decade or so ago the two big airline-producing companies came to the Farnsworth Air Show with two competing visions of the future. Just like Canon and Nikon at Photokina 2014. Article on dslrbodies.com. Nikon and Canon Reverse Positions. Back in 2007, Nikon did something really remarkable: they made DX and FX versions of essentially the same camera (D300 and D3, respectively). Article on dslrbodies.com. Photokina m4/3 Announcements. Article on sansmirror.com. Olympus 40-150mm f/2.8, a re-announced E-M1, the Panasonic GM5 sports an EVF, Panasonic 35-100mm for GM. Sony’s FE-Mount Offerings Expand. Sony announced two new FE-mount lenses at Photokina, the 28-135mm f/4 for video cameras and the Sony/Zeiss 16-35mm f/4. Article on sansmirror.com. 16-35mm f/4 lens page. While I don’t have a camera to play with, only images shot by others who’ve had access to the camera, I can’t answer all the detailed questions some have at the moment. That said, things are becoming clearer. The Consumer Electronics Scenario. In the traditional Japanese consumer electronics scenario, you create entities that have great overlap in features/performance and place them at different price points. Article on dslrbodies.com. CineStill bwXX Film. A “new” (old) film stock arrives. Article on filmbodies.com. Nikon Introduces the Nikon D750 FX Camera. So what exactly is the D750 that Nikon announced today? Article on dslrbodies.com. D750 Data Page. New Lenses for Nikon Bodies. Announcements from Nikon, Sigma, and Tamron. Article on dslrbodies.com. Nikon 20mm f/1.8 data page. Sigma 18-300mm f/3.5-6.3 data page. Sigma 150-600mm Sport and Sigma 150-600 Contemporary data pages. Tamron 15-30mm data page. Other New Stuff. Amongst all the bigger announcements were some smaller things. Article on dslrbodies.com. Fujifilm’s Mirrorless Photokina. Fujifilm today announced items that had been already disclosed through leaks, though additional details are now available. Article on sansmirrorl.com. Fujifilm 50-140mm f/2.8 lens page. Fujifilm 56mm f/1.2 APD lens page. Fujifilm Updates the X Series Cameras. Late last month Fujifilm announced the X30 camera, the latest in the X## series of cameras. Today Fujifilm announced the X100T, the latest in the X100 series. Article on gearophile.com. Apple Ups the Smartphone Ante. Apple’s new iPhone 6 and 6 Plus, announced yesterday, push even further into the compact camera arena. Article on gearophile.com. Marketing Days (or is it Daze?). You might have noticed something: no real Photokina announcements were made today. Article on dslrbodies.com. Canon Lens Price Drop. When Canon dropped some of their lens prices recently, I wondered how that compared to the equivalent Nikon lenses. Article on dslrbodies.com. How Many Times Do You Switch? t’s been fifteen years now since I began using DSLRs as my primary camera. During that time, Nikon has made 37 DSLR models (plus the Nikon 1’s, which probably should be considered). How many have you purchased, used, and why? Article on dslrbodies.com. New F-Mount lens announced: Zeiss Otus 85mm f/1.4. Camera Pricing Has Been Going Up. Yes, I know you can find all kinds of deeply discounted refurbished or previous generation cameras on sale at bargain prices these days. But for the Japanese companies, those ships have already sailed. Article on dslrbodies.com. E-Mount for Smartphones. Sony today introduced a number of products at IFA in Europe, including the QX1, a US$400 smartphone accessory that accepts E-mount lenses, essentially making your smartphone into a mirrorless camera of sorts. Article on sansmirror.com. New m4/3 Lens announced: SLRMagic 10mm t/2.1.